Karimfar, M., Gholizadeh, S., Hajrasouliha, A., Miri, A., Tabrizian, K., Azami, K., Abdollahi, M., Sharifzadeh, M. (2009). Low Dose Morphine Enhances Morphine Antinociception Effects in the Animals Pretreated with Selective and Non-Selective Phosphodiestrase Inhibitors. Iranian Journal of Pharmaceutical Sciences, 5(2), 73-81. Mohammad Hassan Karimfar; Shervin Gholizadeh; Amir Peyman Hajrasouliha; Abdol Hossain Miri; Kaveh Tabrizian; Kian Azami; Mohammad Abdollahi; Mohammad Sharifzadeh. "Low Dose Morphine Enhances Morphine Antinociception Effects in the Animals Pretreated with Selective and Non-Selective Phosphodiestrase Inhibitors". 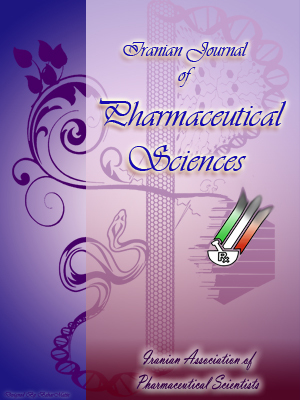 Iranian Journal of Pharmaceutical Sciences, 5, 2, 2009, 73-81. Karimfar, M., Gholizadeh, S., Hajrasouliha, A., Miri, A., Tabrizian, K., Azami, K., Abdollahi, M., Sharifzadeh, M. (2009). 'Low Dose Morphine Enhances Morphine Antinociception Effects in the Animals Pretreated with Selective and Non-Selective Phosphodiestrase Inhibitors', Iranian Journal of Pharmaceutical Sciences, 5(2), pp. 73-81. Karimfar, M., Gholizadeh, S., Hajrasouliha, A., Miri, A., Tabrizian, K., Azami, K., Abdollahi, M., Sharifzadeh, M. Low Dose Morphine Enhances Morphine Antinociception Effects in the Animals Pretreated with Selective and Non-Selective Phosphodiestrase Inhibitors. Iranian Journal of Pharmaceutical Sciences, 2009; 5(2): 73-81. In this study, we investigated the interactive effects of intraperitoneal (i.p.) injections of three different phosphodiesterase inhibitors (PDEIs) on morphine-induced analgesia in mice using tail-flick method. Subcutaneous administration of morphine (1, 3 and 6 mg/kg) caused significant antinociceptive effects in a dose dependent manner. Administration of pentoxifylline (12.5, 25, 50 and 100 mg/kg, i.p. ), milrinone (3 and 4.5 mg/kg, i.p.) and theophylline (25, 50 and 100 mg/kg, i.p.) as selective and non-seletive phosphodiesterase inhibitors induced analgesia in mice. We also examined the antinociceptive effects of these three PDEIs in combination with non-effective dose of morphine (1 mg/kg). These combinations increased analgesia effects compared to the either morphine or respective phospho-diestrase inhibitor groups significantly. Our findings strongly suggest that PDEIs can induce analgesia and potentiate morphine antinociception effect via possible interactions on the same molecular or biochemical pathways. Cyclic nucleotide phosphodiesterases (PDEs) are enzymes that regulate the cellular levels of the second messengers, cAMP and cGMP, by controlling their rates of degradation . The hydrolysis of the cyclic nucleotides cAMP and cGMP to their corresponding inactive 5'-monophosphate counterparts is catalyzed by PDEs as a superfamily . There are 11 different PDE families, with each family typically having several different isoforms and splice variants. These unique PDEs differ in their three-dimensional structure, kinetic properties, modes of regulation, intracellular localization, cellular expression and inhibitory sensitivities . There is experimental evidence suggesting that modification of the intracellular levels of cAMP or cGMP in peripheral sensitive neurons modulates hyperalgesia. Overall, elevated levels of cAMP are associated with enhanced hyperalgesia, whereas elevated levels of cGMP are associated with inhibition of hyperalgesia, at least in mechanical hyperalgesia [3, 4]. Most of these studies focus on the exogenous addition of stimuli that modulate the levels of these cyclic nucleotides. However, a considerable number of studies have investigated the importance of the balance of these cyclic nucleotides in the genesis of inflammatory hyperalgesia [5-7]. There is an association between hyperalgesia and activation of adenylate cyclase as well as antinociception with activation of a soluble guanylate cyclase. The intracellular levels of cAMP that enhance hyperalgesia are controlled by the PDE4 isoform and appear to result in the activation of protein kinase A. The balance between the intracellular levels of cAMP and cGMP may be fundamental in the control of pain in response to inflammatory mediators. In this sense, the discovery of substances that act by tilting the cAMP/cGMP balance and/or function in primary sensory neurons may constitute a new class of peripheral analgesics . Data suggest that cAMP-dependent protein kinase activity may be upregulated in the brain with morphine tolerance, and that this upregulation is critical to the expression of tolerance to the antinociceptive effects of morphine. In the spinal cord, however, the activity of cyclic nucleotide dependent protein kinases, and possibly their substrate proteins, may be affected by chronic morphine exposure such that inhibition of these kinases produces hyperalgesia . Studies have shown that modulation of cyclic nucleotide levels by changes in particulate cGMP hydrolysis may produce or allow for development of complete tolerance to various morphine-induced behaviors . The clinical use of morphine is limited in practice by its tendency to cause tolerance and dependence with prolonged or repeated administration . There are evidences that show the changes of opioid receptors and second messengers (eg. cAMP) in opiate functions by using biochemical and molecular techniques . Figure 1. Antinociceptive effects of morphine on tail-flick latency. Subcutaneous (s.c.) administration of three doses of morphine (1, 3, 6 mg/kg) caused an antinociceptive effect in a dose dependent manner. There was no significant analgesic effect at the dose of 1 mg/kg, but other doses used (3 and 6 mg/kg) induced significant antinociception. Tail-flick latency was evaluated 5 min. after s.c. injection of morphine. Values are presented as mean±SEM for at least 7 animals in each group. *p < 0.05 and ***p < 0.001 compared with control group. The involvement of PDEs in the production of different kinds of antinocicep-tion in rats and mice has been reported previously [12-16]. In contrast, some other studies showed that cAMP levels seem to be irrelevant to the pain . The antinociceptive effects of sildenafil, a specific PDE 5 inhibitor, has been investigated by some researchers . Co-administration of sildenafil significantly enhanced the antinociceptive effect of morphine. The antinociception produced by the drugs alone or combined was due to local action, as its administration in the contralateral paws was ineffective. Pretreatment with Nw-nitro-L-arginin methyl ester (an NO synthesis inhibitor), methylene blue (gunalyl cyclase inhibitor) or naloxone (opioid receptor antagonist) blocked the effect of sildenafil-morphine combination. The results suggest that opioid receptor, NO, and cGMP mechanisms are involved in the combined antinociceptive effect. Furthermore, sildenafil produced antinociception per se and increased the response of morphine, probably through the inhibition of cGMP degradation . Modulation of cyclic nucleotide levels by changes in particulate cGMP hydrolysis may produce development of complete tolerance to various morphine-induced behaviors . In another study, low doses of rolipram, as a PDE inhibitor by itself does not have any effect on the antinociception . In addition studies have shown that intrathecal zaprinast, a phosphodiesterase inhibitor, and morphine are effective against acute pain and facilitated pain state. Therefore, it is suggested that zaprinast may interact synergistically with morphine . In this study, we examined the antinocicep-tive effects of milrinone, pentoxifylline and theophylline by themselves and in combination with low dose of morphine to determine which biochemical pathways are involved in the synergistic effects of PDE inhibitors and morphine in antinociception. Male mice (25-30 g) were subjects in the present study. The animals were purchased from Pasteur Institute of Iran and housed in groups of five in each cage, handled daily and provided food and water ad libitum. A 12 h light/12 h dark cycle was maintained and the animals were trained and tested during the light cycle. These animal experiments were carried out in accordance with recommen-dations from declaration of Helsinki and the internationally accepted principles in the use of experimental animals. Figure 2. Interactive effects of milrinone and morphine on tail-flick latency. Intraperitoneal administration of milrinone (2, 3 and 4.5 mg/kg) induced antinociception in comparison with control (saline-treated) group. The evaluation of combination effects of milrinone with non-effective dose of morphine (1 mg/kg) showed a significant analgesic effect for doses 3 and 4.5 mg/kg compared to morphine-treated group. Data are presented as mean ± SEM for at least 7 animals per group. (#p < 0.05, ##p < 0.01 and ###p < 0.001) compared to control (saline-treated group) and (*p < 0.05 and **p < 0.01) compared with morphine group. A standardized tail-flick apparatus (Tail-flick unit 7360, Ugo Basile, Italy) with a radiant heat source connected to an automatic timer was used to assess the antinociceptive (analgesic) response. The tail-flick latency was measured from the start of the heat stimulus applied to the distal 2 cm of the tail until the animal exhibited a flick of the tail. The intensity of the stimulus was adjusted to achieve baseline latencies (pre-value) between 3 and 4 seconds. Cut-off time (10 s) was used to minimize damage to the tail. The pre-value was obtained prior to injection. Morphine sulfate (Temad, Iran), milrinone (vial 1mg/ml Sandoz®), pentoxifylline and theophylline (aminophylline 25 mg/ml Darou Pakhsh) were used in our study. All drugs were dissolved in distillated water and also all drugs were injected i.p. except morphine that was administered subcutaneously. The results of the experiments were evaluated by one-way analysis of variance (ANOVA). The differences between groups were further analyzed with Newman-Keuls post-hoc test. All results are presented as means±SEM for at least 7 animals in each group. A p value of 0.05 or less was considered statistically significant. Figure 3. Interactive effects of pentoxifylline and morphine on tail-flick latency. Intraperitoneal administration of pentoxifylline (12.5, 25, 50 and 100 mg/kg) induced analgesia in comparison with control (saline-treated) group. (12.5, 25, 50 and 100 mg/kg) induced analgesia in comparison with control (saline-treated) group. The significant response was observed with 100 mg/kg of pentoxifylline (###p < 0.001). The combination effects of pentoxifylline with non-effective dose of morphine (1 mg/kg) showed a significant increased analgesia compared to morphine group (**p < 0.01, *p < 0.05 and ***p < 0.001, respectively). The antinociceptive effects of low dose of morphine (1 mg/kg) and pentoxifylline (12.5, 25 and 50 mg/kg) in combination were increased significantly (+++p < 0.001, +p < 0.05 and +++p < 0.001) compared to the each corresponding pentoxifylline group (###I < 0.001) compared with control animals. (*p < 0.05, **p < 0.01 and ***p < 0.001) compared with morphine group and (+++p < 0.001, +p < 0.05 and +++p < 0.001) compared with 12.5, 25 and 50 mg/kg of pentoxifylline, respectively. Subcutaneous administration of different doses of morphine (1, 3, 6 mg/kg) showed an antinociceptive effect in a dose dependent manner (Figure 1). There was no significant analgesic effect at the dose of 1 mg/kg, but other doses (3 and 6 mg/kg) induced antinoci-ception, significantly (p < 0.05 and p < 0.001,respectively). The maximum antinociception was observed at the dose of 6 mg/kg. Tail-flick latency was evaluated 5 min. after subcutaneous injections of morphine. The data of intraperitoneal administration of milrinone (2, 3 and 4.5 mg/kg) is shown in Figure 2. Milrinone at doses of 3 and 4.5 mg/kg (i.p.) induced significant antinociception (p < 0.05) in comparison with control group (saline-treated) (Figure 2). Administration of the milrinone with dose 2 mg/kg did not show any significant alteration compared with saline treated animals (Figure 2). Tail flick latency was evaluated 30 min. after i.p. injection of milrinone. Also, the evaluation of interactive effects of milrinone at 3 and 4.5 mg/kg with a non-effective dose of morphine (1 mg/kg) showed a significant increase analgesic effect (p < 0.01 and p < 0.001, respectively) in comparison with control (saline-treated) and morphine treated groups (p < 0.05 and p < 0.01, respectively) (Figure 2).Milrinone (2, 3 and 4.5 mg/kg, i.p.) was injected 30 min. before morphine (1 mg/kg, s.c.) administration. Administration of the pentoxifylline with dose 12.5, 25 and 50 mg/kg did not cause any significant antinociception compared with saline treated animals (Figure 3). The maximum response was obtained with 100 mg/kg of pentoxifylline (p < 0.001) (Figure 3). Tail flick latency was evaluated 30 min. after i.p. injection of pentoxifylline. Also, the evaluation of combination effects of pentoxifylline (12.5, 25, 50 and 100 mg/kg, i.p.) with non-effective dose of morphine (1 mg/kg) showed a significant increase analgesic effect in all four doses compared to saline-treated (p < 0.001) and morphine groups (p < 0.01 and p < 0.05, p < 0.001), respectively (Figure 3). Moreover, the antinociceptive effects of low dose of morphine (1 mg/kg) and pentoxifylline (12.5, 25 and 50 mg/kg) in combination were increased significantly (p < 0.001, p < 0.05 and p < 0.001) compared to the each corresponding pentoxifylline group (Figure 3). Pentoxifylline (12.5, 25, 50 and 100 mg/kg, i.p.) was injected 30 min. before morphine (1 mg/kg, s.c.) administration. Figure 4. Interactive effects of theophylline and morphine on tail-flick latency. Intraperitoneal administration of theophylline (50 and 100 mg/kg) induced significant antinociception in comparison with control (saline-treated) group. The combinatiion effects of theophylline (25, 50 and 100 mg/kg) with non-effective dose of morphine (1 mg/kg) showed a significant analgesic effect in comparison with either control (saline-treated) (## p < 0.01 and ###p < 0.001) or morphine (*p < 0.05 and **p < 0.01, ***p < 0.001) groups. The antinociceptive effect of morphine with low dose (1 mg/kg) and theophylline (25 mg/kg) in combination was increased significantly (+++p < 0.001) compared to the respective theophylline group. (#p < 0.5, ##p < 0.01 and ###p < 0.001) compared with control animals. (*p < 0.05 and **p < 0.01, and ***p < 0.001) compared with morphine group and (+++p < 0.001) compared with theophylline (25 mg/kg). The data of intra-peritoneal administration of theophylline (25, 50 and 100 mg/kg) is shown in Figure 4. Significant antinociception effect was observed with doses of 50 and 100 mg/kg of theophylline compared to the saline group (p < 0.01 and p < 0.05, respectively) (Figure 4). Also, the evaluation of interactive effects of theophylline (25, 50 and 100 mg/kg) with non-effective dose of morphine (1 mg/kg) showed a significant analgesic effect in a dose dependent manner in comparison with either control (saline-treated) (p < 0.01 and p < 0.001) or morphine (p < 0.05 and p < 0.01, p < 0.001) groups (Figure 4). The antinoci-ceptive effect of morphine with low dose (1 mg/kg) and theophylline (25 mg/kg) in combination was increased significantly (p < 0.001) compared to the respective theophylline group (Figure 4). Theophylline ( 25, 50 and 100 mg/kg, i.p.) was injected 30 min. before morphine (1 mg/kg, s.c.) administration. Results of the current study presented here demonstrated that intraperitoneal administration of milrinone as selective and either pentoxifylline or theophylline as non-selective PDEs inhibitors increased tail-flick latency. Also, the co-administration of these PDEIs with an ineffective dose of morphine (1 mg/kg) caused a significant increase in the latency in a dose dependant manner. The molecular events associated with hyperalgesia, triggered by the final hyperalgesic mediators (i.e., prostanoids and sympathomimetic amines), are not yet fully understood. There is experimental evidence suggesting that up or down functional regulation of the primary sensory neuron sensitivity to mechanical stimulation may result from a neuronal balance of Ca2+/cAMP and cGMP concentrations, respectively [5-7]. The pivotal role of cAMP in the sensitization of the primary sensory neuron is particularly convincing when mechanical stimulation was used as the hyperalgesic stimulus . Specific and non-specific inhibitors of PDEs have been used to support the participation of cAMP in mechanical hyperalgesia . Milrinone, one of the best-known PDE4 inhibitors, increased the tail-flick latency when administered alone and induced an elevated analgesic effect when administered with an ineffective dose of morphine (1 mg/kg). However, co-administration of morphine at this dose with non-selective PDE inhibitors (pentoxiphylline and theophylline) not only resulted in a significant analgesic effect in comparison with morphine, but also caused a significant increase in tail-flick latency in comparison with the corresponding PDE inhibitor group administered alone. Possible explanations can be deduced from the general pharmacological actions of these agents. Non-selective inhibitors, in contrast with selective PDE 4 inhibitors such as milrinone, prevent the effects of not only cAMP selective PDE (PDE 4) but also other types of PDEs, such as Ca2+-dependant, photoreceptor and cGMP selective PDEs. Moreover, these findings are in agreement with earlier studies which showed that co-administration of non-selective PDE inhibitors with morphine can restore the analgesic activity of morphine [20, 21] and influence morphine intake in patients . The present findings suggest that coad-ministration of compounds which increase cAMP level with morphine may be a useful strategy to attenuate the development of morphine dependence/tolerance in the clinic. Several biochemical changes including intracellular cAMP systems and Ca2+ mobilization have been suggested to play a role in morphine physical dependence /tolerance. Co-administration of nefiracetam, enprofylline and rolipram with morphine during the pretreatment period, significantly reduced the withdrawal signs, moreover, the tolerance was significantly attenuated. Acute administration of nefiracetam failed to reduce the withdrawal signs and did not affect the antinociceptive effect of morphine in morphine-naive mice. Theophylline tended to attenuate the development of morphine dependence/tolerance . Moreover, findings demonstrated that co-administration of rolipram or diazepam(phosphodiesterase (PDE) 4 inhibitors) with morphine abolish the development of morphine dependence and suggest that these compounds prevent the up-regulation of the cAMP pathway and the associated increase in cAMP level after naloxone administration . In addition to a role for cAMP in modulating hyperalgesia, direct blockade of ongoing mechanical hyperalgesia has been observed after local administration of dibutyryl cGMP or substances that stimulate neuronal soluble guanylate cyclase (acetylcholine or the NO donors, SNAP and sodium nitroprusside) . Several lines of evidence have shown a role of the NO/cGMP signaling pathway in nociception . This concept is based on the fact that local administration of L-arginine produces antinociception in rats with carageenan-induced hyperalgesia, the effect being blocked by NO inhibitors and methylene blue ( a soluble guanylyl cyclase inhibitor) . NO caused an enhancement of spontaneous contractions in DSM (detrusor smooth muscle) by accelerating spontaneous action potentials through cGMP-independent mechanisms, which may involve the Ca release from intracellular stores, whilst cGMP itself has inhibitory effects on DSM contractility. Sildenafil may indirectly suppress DSM contractility by diminishing synchronicity between functional units of DSM bundles without inhibiting excitability of DSM themselves . The involvement of the balance between neuronal cAMP/cGMP levels and inflammatory hyperalgesia, has been confirmed by the study of ODQ, a specific inhibitor of soluble guanylate cyclase, on the antinociceptive effect of SNAP (an NO donor) . However, several observations indicate that the L-arginine/NO/cyclic GMP pathway has a peripheral hyperalgesic rather than analgesic effect. Thus, the intraplantar or systemic administration of Nw-nitro-L-arginine methyl ester (L-NAME, another NOS inhibitor), but not D-NAME, has been reported to produce dose-dependent antinoci-ception in the second phase of the formalin test in rats . A nociceptive role for the L-arginine/NO/cyclic GMP pathway has also been demonstrated using other tests, such as the tail-flick and hot-plate tests, acetic acid or phenyl-r-quinone-induced writhing and formalin-induced paw licking in mice [29-32]. In conclusion, the results presented in this paper show an association between hyperalgesia and activation of adenylate cyclase as well as antinociception with activation of a soluble guanylate cyclase. The intracellular levels of cAMP that enhance hyperalgesia are controlled by the PDE4 isoform and appear to result in the activation of protein kinase A. The balance between the intracellular levels of cAMP and cGMP may be fundamental in the control of pain in response to inflammatory mediators. In this sense, the discovery of substances that act by tilting the cyclic AMP/ cyclic GMP balance and/or function in primary sensory neurons may constitute a new class of peripheral analgesics. Bender AT, Beavo JA. Cyclic nucleotide phospho-diesterases: Molecular regulation to clinical use. Pharmacol Rev 2006; 58: 488-520. Dal Piaz V, Giovannoni MP. Phosphodiesterase 4 inhibitors, structurally unrelated to rolipram, as promising agents for the treatment of asthma and other pathologies. Eur J Med Chem 2000; 35: 463-1. Jain NK, Patil CS, Singh A, Kulkarni SK. Sildenafil, a phosphodiesterase-5 inhibitor, enhances the antinociceptive effect of morphine. Pharmacology 2003; 67: 150-6. Tao YX, Hassan A, Haddad E, Johns RA. Expression and action of cGMP-dependent protein kinase alpha in inflammatory hyperalgesia in rat spinal cord. Neuroscience 2000; 95: 525-33. Durate ID, Lorenzetti BB, Ferreira SH. Peripheral analgesia and activation of the nitric oxide-cGMP pathway. Eur J Pharmacol 1990; 186: 289-93. Kress M, Rodl J, Reeh PW. Stable analogues of cAMP but not cGMP sensitize unmyelinated primary afferents in rat skin to heat stimulation but not to inflammatory mediators, in vitro. Neuroscience 1996; 74: 609-17. Taiwo YO, Levine JD. Further confirmation of the role of adenyl cyclase and of cAMP-dependent protein kinase in primary afferent hyperalgesia. Neuroscience 1991; 44: 131-5. Cunha FQ, Teixeira MM, Ferreira SH. Pharma-cological modulation of secondary mediator systems--cAMP and cGMP--on inflammatory hyperalgesia. Br J Pharmacol 1999; 127: 671-8. Bernstein MA, Welch SP. Effects of spinal versus supraspinal administration of cyclic nucleotide-dependent protein kinase inhibitors on morphine tolerance in mice. Drug Alcohol Depend 1997; 44: 41-6. Burton CK, Ho IK, Hoskins B. Evidence for involvement of cGMP phosphodiesterase in morphine tolerance. J Pharmacol Exp Ther 1990; 252: 104-1. Mamiya T, Noda Y, Ren X, Hamdy M, Furukawa S, Kameyama T, Yamada K, Nabeshima T. Involvement of cAMP systems in morphine physical dependence in mice: Prevention of development of morphine dependence by rolipram, a phosphodiesterase 4 inhibitor. Br J Pharmacol 2001; 132: 1111-7. Galeotti N, Ghelardini C, Bartolini A. Effect of pertussis toxin on morphine, diphenhydramine, baclofen, clomipramine and physostigmine antinociception. Eur J Pharmacol 1996; 308: 125-33. Galeotti N, Ghelardini C, Bartolini A. The role of potassium channels in antihistamine analgesia. Hawes BE, Fried S, Yao X, Weig B, Graziano MP. Nociceptin (orl-1) and mu-opioid receptors mediate mitogen-activated protein kinase activation in cho cells through a gi-coupled signaling pathway: Evidence for distinct mechanisms of agonist-mediated desensitization. J Neurochem 1998; 71: 1024-33. Shah S, Breivogel C, Selly D, Munirathinam G, Childers S, Yoburn BC. Time-dependent effects of in vivo pertussis toxin on morphine analgesia and g-proteins in mice. Pharmacol Biochem Behav 1997; 56: 465-9. Womer DE, DeLapp NW, Shannon HE. Intrathecal pertussis toxin produces hyperalgesia and allodynia in mice. Pain 1997; 70: 223-8. Mixcoatl-Zecuatl T, Aguirre-Banuelos P, Granados-Soto V. Sildenafil produces antinocicep-tion and increases morphine antinociception in the formalin test. Eur J Pharmacol 2000; 400: 81-7. Yoon MH, Choi JI, Kim SJ, Kim CM, Bae HB, Chung ST. Synergistic antinociception between zaprinast and morphine in the spinal cord of rats on the formalin test. Eur J Anaesthesiol 2006; 23: 65-70. Ouseph AK, Khasar SG, Levine JD. Multiple second messenger systems act sequentially to mediate rolipram-induced prolongation of prostaglandin E2-induced mechanical hyperalgesia in the rat. Neuroscience 1995; 64: 769-76. Raghavendra V, Tanga FY, DeLeo JA. Attenuation of morphine tolerance, withdrawal-induced hyperalgesia, and associated spinal inflammatory immune responses by propentofylline in rats. Sweitzer SM, Schubert P, DeLeo JA. Propento-fylline, a glial modulating agent, exhibits antiallodynic properties in a rat model of neuropathic pain. J Pharmacol Exp Ther 2001;297: 1210-7. Wordliczek J, Szczepanik AM, Banach M, Turchan J, Zembala M, Siedlar M, Przewlocki R, Serednicki W, Przewlocka B. The effect of pentoxifiline on post-injury hyperalgesia in rats and postoperative pain in patients. Life Sci 2000;66: 1155-64. Itoh A, Noda Y, Mamiya T, Hasegawa T, Nabeshima T. A therapeutic strategy to prevent morphine dependence and tolerance by coadmin-istration of camp-related reagents with morphine.Methods Find Exp Clin Pharmacol 1998; 20: 619-25. Gonzalez-Cuello A, Sanchez L, Hernandez J, Teresa Castells M, Victoria Milanes M, Laorden ML. Phosphodiesterase 4 inhibitors, rolipram and diazepam block the adaptive changes observed during morphine withdrawal in the heart. Eur J Pharmacol 2007; 570: 1-9. Wang JF, Khasar SG, Ahlgren SC, Levine JD. Sensitization of c-fibres by prostaglandin E2 in the rat is inhibited by guanosine 5'-O-(2-thiodiphos-phate), 2',5'-dideoxyadenosine and walsh inhibitor peptide. Neuroscience 1996; 71: 259-63. Yanai Y, Hashitani H, Hayase M, Sasaki S, Suzuki H, Kohri K. Role of nitric oxide/cGMP pathway in regulating spontaneous excitations in detrusor smooth muscle of the guinea-pig bladder.Neurourol Urodyn 2008; 27: 446-53. Moro MA, Russel RJ, Cellek S, Lizasoain I, Su Y, Darley-Usmar VM, Radomski MW, Moncada S. cAMP mediates the vascular and platelet actions of nitric oxide. Confirmation using an inhibitor of the soluble guanylyl cyclase. Proc Natl Acad Sci USA 1996; 93: 1480-5. Haley JE, Dickenson AH, Schachter M. Electro-physiological evidence for a role of nitric oxide in prolonged chemical nociception in the rat.Neuropharmacology 1992; 31: 251-8. Kawabata A, Manabe S, Manabe Y, Takagi H. Effect of topical administration of L-arginine on formalin-induced nociception in the mouse: A dual role of peripherally formed NO in pain modulation. Br J Pharmacol 1994; 112: 547-50. Malmberg AB, Yaksh TL. Spinal nitric oxide synthesis inhibition blocks nmda-induced thermal hyperalgesia and produces antinociception in the formalin test in rats. Pain 1993; 54: 291-300. Morgan CV, Babbedge RC, Gaffen Z, Wallace P, Hart SL, Moore PK. Synergistic anti-nociceptive effect of L-NG-nitro arginine methyl ester (L-NAME) and flurbiprofen in the mouse. Br J Pharmacol 1992; 106: 493-7. Mustafa AA. Mechanisms of L-NG -nitro arginine methyl ester-induced antinociception in mice: A role for serotonergic and adrenergic neurons.Gen Pharmacol 1992;23:1177-1182.